Discontent’s giant skateboarding, stoned Bong Guy greets tourists driving into Grand Junction off of I-70B. Art was created by their employee Kyle O’Connor. Try as they may, the Grand Junction City Council, Mesa County Commissioners and even Diane Cox haven’t been able to stop the pot culture from seeping into Grand Junction. It’s starting to show up everywhere these days, despite city and county-wide bans on retail marijuana commerce. 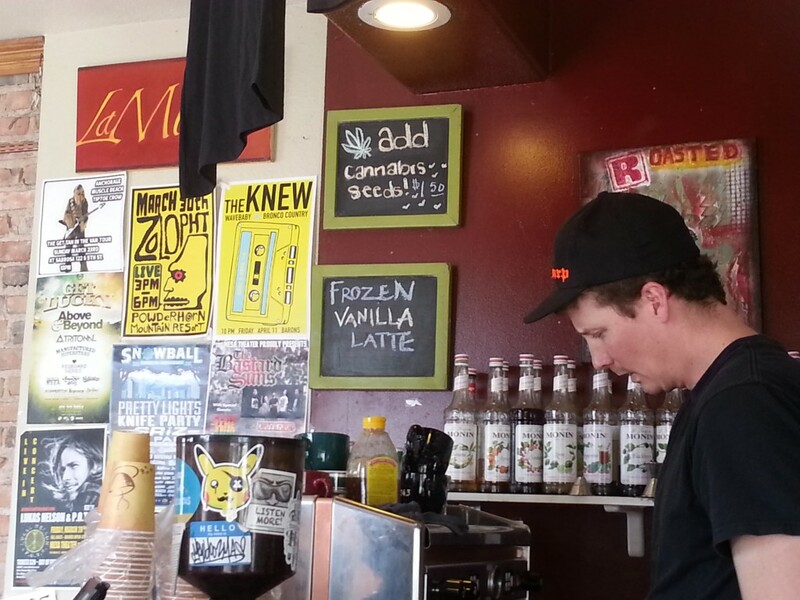 Roasted Espresso and Subs on 5th Street and Colorado Avenue, the coolest coffee bar in town, now offers to add cannabis seeds to any item for $1.50. Shelled cannabis seeds contain a high amount of protein and nutrients like iron, vitamin B and calcium. Reader’s Digest calls them “super seeds” and says they are a “great source of complete protein and omega-3 and omega-6 fatty acids. Cannabis seeds also contain phytosterols, plant-based compounds that help lower cholesterol levels.” The THC content of seeds is almost nonexistent. Discontent at First Street and North Avenue — a high-visibility location at the west entrance to town — bills itself as a “lifestyle store for the counter-culture” and sells a wide selection of pipes, rolling papers, vaporizers, water pipes and other accessories. The quality of their selection of glass art bongs is so magnificent it’s hard to imagine actually using them to smoke. Discontent also carries skateboarding accessories, Van’s sneakers and clothing for the younger set, but they report their clientele has a wide age range. They had one customer who was 85 years old. (Discontent checks date of birth on customers’ IDs.) Discontent is now sporting a huge picture of a stoned, skateboarding bong-guy with bloodshot eyes on its front window. Tourists coming in off I-70 stop in at Discontent to ask directions to the Colorado National Monument, but the store manager reports the most frequent question from tourists is “Where are the recreational pot shops?” Unfortunately, Discontent must direct them out of town to Rifle, Ridgway or Carbondale, where retail recreational marijuana stores are permitted, to spend their cash. Discontent has been so successful in its current location that they are planning to open a second store in Glenwood Springs, one of the places that has also allowed retail MJ sales. Locals can only watch helplessly as cash-laden pot tourists drive straight through town without stopping and head to points beyond to spend their money. 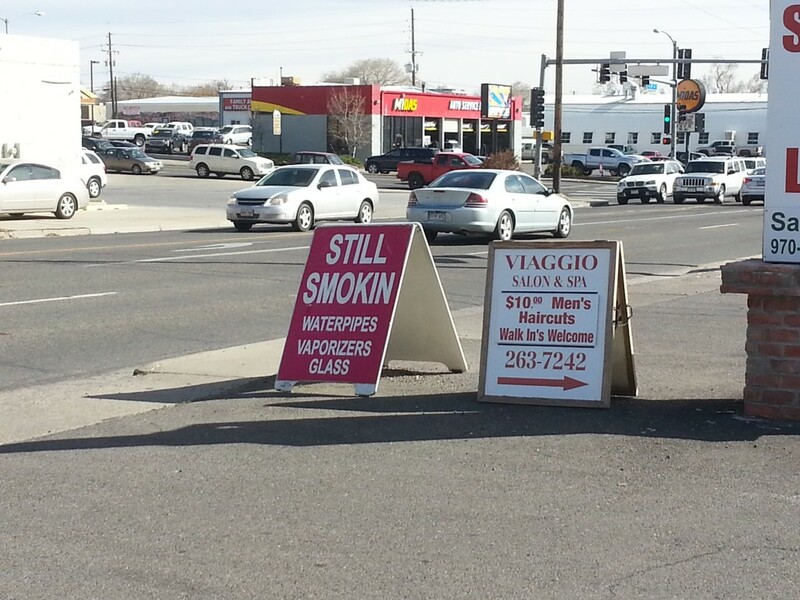 Another smoke shop near First and North, Still Smokin’, now has an A-frame sign set outside by the street advertising waterpipes, vaporizers and glass. Under the law, a non-resident individual visiting Colorado from out of state is allowed to possess 1/4 of an ounce of pot (3.5 grams), which sells for about $40-$60 in the Denver area. The website PriceOfWeed.com — a GasBuddy-like crowdsourcing site that tracks marijuana prices around the globe — reports that as of March 18, 2014 an ounce of high quality marijuana was selling in Denver for $238.54, based on 2,475 reports. If you live in Grand Junction and are looking for recreational marijuana stores, you’ll need to take a day trip to the mountain towns, since sales of recreational pot are banned locally. The only place marijuana is sold in Mesa County is Colorado Alternative Health Care at 125 Peach Street Unit B in Palisade, but it is a medical cannabis shop only. If you head for the hills, Acme Healing Centers is a recreational chain with three shops on the western slope, one each in Crested Butte, Ridgway and Durango, and Acme gives Veterans and AARP members a 10% discount. Still Smokin’ advertises pot paraphernalia by the busy intersection of First Street and North Ave. as tourists drive through town to spend their cash at recreational pot shops in other towns like Rifle, Carbondale and Ridgway. There are several other recreational shops in Rifle, too. Towns that have permitted sales of recreational pot are filling their public coffers with sales taxes. After the Doctor’s Garden opened in Carbondale on January 15, the town collected more than three times the amount of sales tax revenue from marijuana than it did in January 2013. Estimates based on sales tax collections indicate the Doctor’s Garden alone raked in over $200,000 in its opening month of January 2014, according to the Aspen Daily News. A list of dispensaries throughout the state is available here.